Hit man Tommy Spinelli (Joe Pesci) has twenty-four hours to deliver a bag of eight "former associates" to an angry mob boss in San Diego. But when a fellow traveler, Charlie (Andy Comeau), mistakenly takes the bag, the heads go to Baja...and Tommy just goes ballistic! While the hit man desperately tries to find Charlie, Charlie desperately tries to find a way to get the bag's horrific contents back across the border. 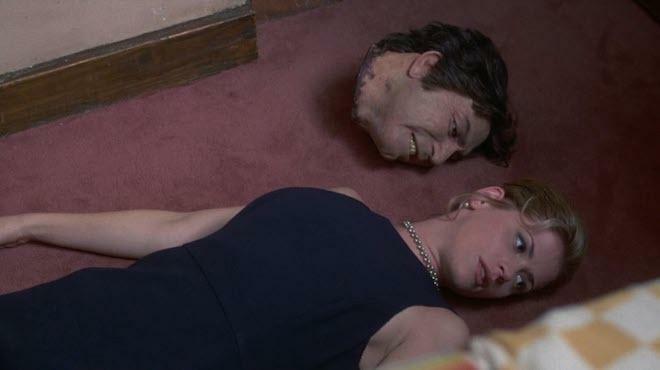 Who's gonna wind up with the heads? And who's just gonna lose his? One thing's for sure...they'll both have to use their noggins to get out of this one! Tom Schulman is probably a name you don't recognize. He is an award-winning writer of movies, such as Dead Poets Society, What About Bob?, Honey I Shrunk the Kids, and Medicine Man. In addition to that, he wrote a film called 8 Heads In a Duffel Bag, which he also directed. Coming off of films like Goodfellas, Casino, and My Cousin Vinny, I'm sure Orion Pictures thought they struck gold when they got Joe Pesci to star as a mob guy yet again with a mix of comedy and mafia ties. What transpired felt lazy and utterly over-the-top, despite Pesci's amazing performance and a young supporting role from David Spade. What is 8 Heads In a Duffel Bag? Well, the title explains it all here as Joe Pesci plays Tommy (yet again), who is transporting 8 severed heads across the country to a mob boss to confirm these poor people are dead. What better way to transport heads than bringing them on a commercial airline flight as checked luggage in a duffel bag? All seems well at first as Tommy sits next to a sweet young man named Charlie who is headed to Mexico to visit his girlfriend (Kristy Swanson) and her parents (George Hamilton and Dyan Cannon) for vacation. It turns out that Charlie and Tommy have the exact same luggage. Bags are switched and Charlie now has 8 Heads In a Duffel Bag, where Tommy has vacation clothes. The rest of the film has Tommy trying to track down Charlie to retrieve the heads, which leads to a series of ridiculous antics. Tommy even tortures and coerces Charlie's best friends (David Spade and Todd Louiso) into helping him find the heads. What works here is Joe Pesci as Tommy. He's scary and funny all at the same time. He just owns every moment he's on screen. It's also great to see a young David Spade use his brand of humor here too, which you almost wish he was cast as the lead opposite Pesci here. The rest of the cast is either bland or so obnoxiously over-the-top, that it's difficult to watch. 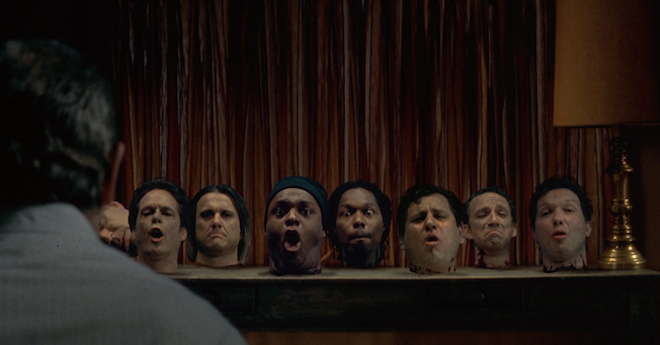 The story itself is silly enough and doesn't take itself too seriously, even when all of the severed heads start singing in harmony, but it's never enough to keep this movie afloat. 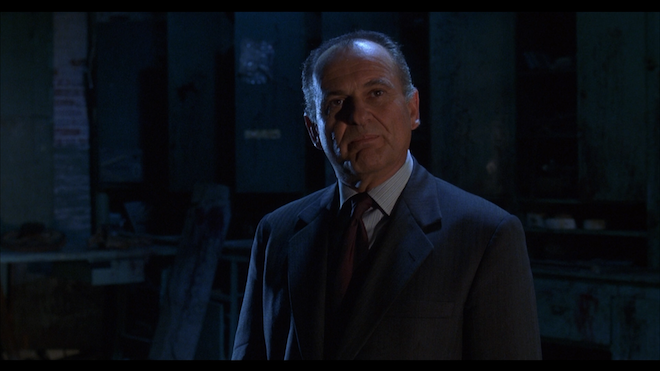 It's a bizarre entry in Joe Pesci's career for sure, but it's not the worst. However you may feel about this movie, one thing is for sure, there is nothing else like it. 8 Heads In a Duffel Bag comes with a 50GB Blu-ray Disc from Twilight Time and is Region A Locked. There were only 3,000 copies made. The disc is housed in a clear, hard plastic case with an insert that consists of an essay by Julie Kirgo on the film. 8 Heads In a Duffel Bag comes with a 1080p HD transfer and is presented in 1 .85:1 aspect ratio. Being only 20 years old, the picture has held up pretty well here. Detail is sharp and colors look great still, but that doesn't mean there aren't any problems. Twilight Time has done a great job with this transfer even if the color palette and style of the original movie is fairly dull. Closeups look vivid, especially of the severed heads that are displayed on the table. The individual hairs and gory details of blood around the necks all look good. Other wrinkles and makeup blemishes show up nicely too. There is a good layer of grain, keeping with the filmic quality with zero glossy effect. Wider shots continue to bring out set details and plant life that never go soft. Colors aren't exactly bright here with blazing primary colors, but the subdued style of the film never falters with its dark-comedic look. There are some earthy tones here, with good browns, greens, and blues with some great flashes of red and orange. Other than this, colors look realistic by never shiny. Black levels are deep and inky for the most part and skin tones are natural. There were still some minor specks of dust and scratches, but that's about it, keeping this video presentation with solid marks. 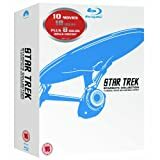 This release comes with both a DTS-HD MA 5.1 mix and a DTS-HD MA 2.0 mix. There isn't a ton of difference between the two options, however the 5.1 option adds more heft and surround material throughout the film. The sound effects or full, but never pack a big punch like you'd expect. The surrounds never get a ton of play, with the exception of some light ambient noises and the score of the film from time to time. Needless to say, this is a front heavy movie when it comes to audio. Dialogue is cleanly presented and easy to follow along with the Italian mafioso accents and is free of any pops, cracks, hiss, and shrills. 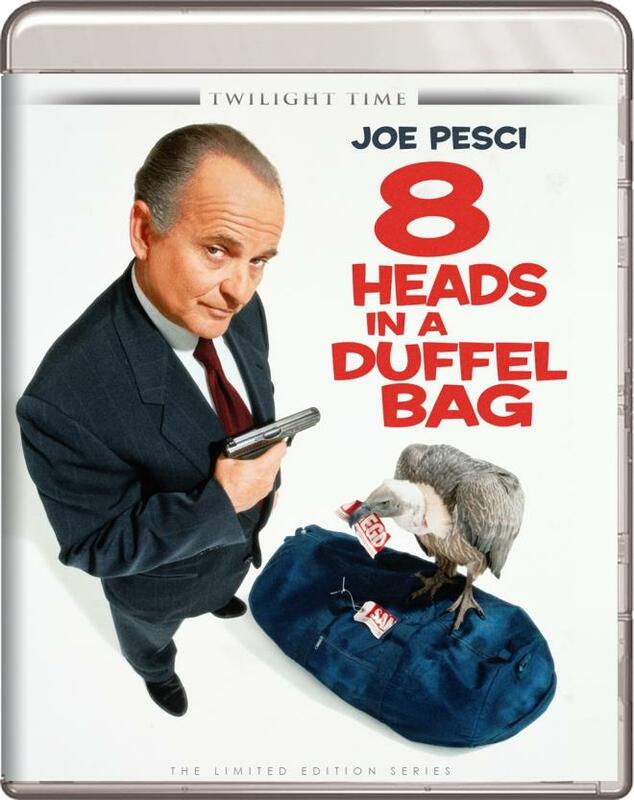 8 Heads In A Duffel Bag is twenty years old and still holds up after all these years, if you like a whacky dark comedy that stars Joe Pesci as the usual mob guy trying to transport severed heads in some luggage. It's original, ridiculous, but mostly fun, and Joe Pesci is perfect for the role. The video and audio are both pleasant, but there are no extras on the disc besides a trailer. If you want to revisit Joe Pesci and David Spade in 1997, give this one a rent.